Victoria Falls Hotel - Victoria Falls' first and grandest hotel! 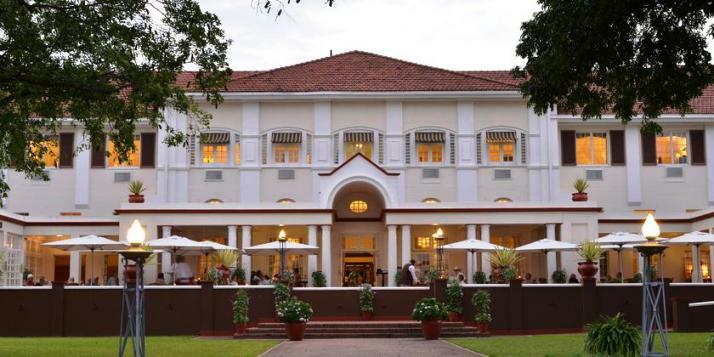 The Victoria Falls Hotel was built in 1904, at the time when the Cape to Cairo Railway line first reached Victoria Falls, this classic and colonial hotel has been established for over 100 years. 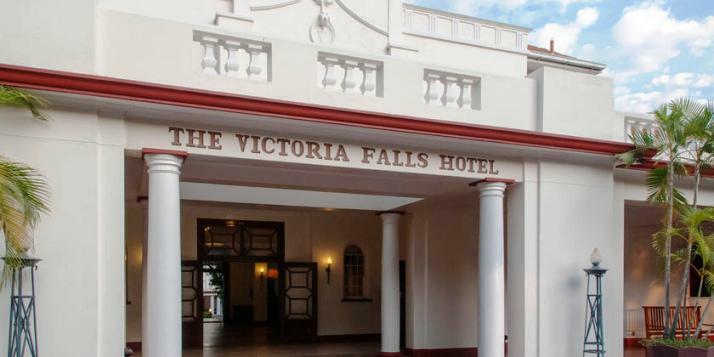 Visiting members of Royal families, international and local statesmen as well as celebrities have chosen to stay at The Victoria Falls Hotel. Being the first hotel to be built it has prime position, with views overlooking the magnificent Victoria Falls Bridge and	gorge below. It has it own private pathway down to the Victoria Falls Rainforest entrance and is also situated within walking distance of the town centre. 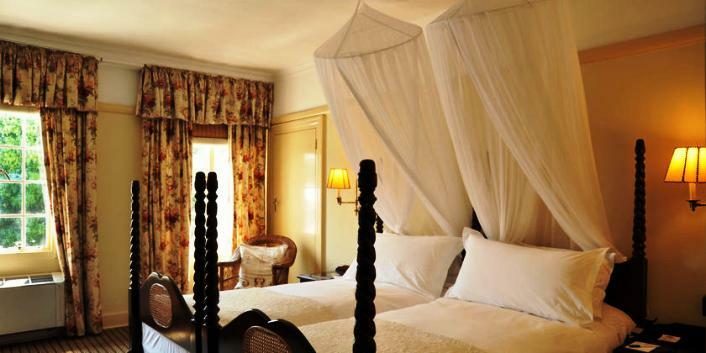 The Victoria Falls Hotel has an atmosphere steeped in history. The old fashioned and traditional décor throughout the hotel is full of colonial grandeur and old world charm. The manicured gardens and beautiful buildings together with the courtyard filled with lily ponds in the middle of the hotel gives a feeling of tranquillity and sheer relaxation. The 161 rooms are decorated in a way that recaptures the comfortable charm of a bygone age, with colonial prints, Edwardian styled furniture and well-chosen artefacts. Some of the deluxe rooms and suites offer breathtaking views across the Victoria Falls Bridge and Zambezi River Gorge, but not all of them, so if a view is important to you make sure you book through an agent who knows the hotel well (like us for instance). We can try to get the best rooms for you when possible, booking quite well in advance is essential for this. Another word of caution here is that the standard rooms although still pricey don't have particularly nice out looks and are quite small. Victoria Falls Hotel is a grand old Colonial hotel - the first hotel ever built in Victoria Falls. It's grandeur and history are certainly an attraction to many of her guests and recent refurbishments make for a very comfortable stay. However, due to its original design many of its rooms don't have the most favourable outlook. If you can try to book one of the deluxe rooms which have much better aspect. • The famous Livingstone Room with its high ceilings makes dining an elegant and memorable affair. Formal evening dress is no longer a requirement. 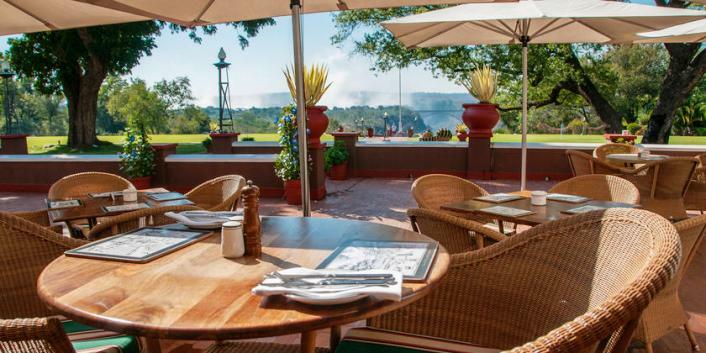 • The Stanley Terrace – over looks the manicured gardens, the Victoria Falls Bridge and the rising spray from the Victoria Falls, this is the only hotel to have such a magnificent view of this. • It's a delightful place to sit and enjoy a meal or the renowned traditional afternoon tea which is served every afternoon. • Later enjoy a famous Livingstone cocktail whilst listening to the mighty roar of the Victoria Falls. A la Carte lunch and light dinners are also served. • The Jungle Junction – Breakfast and dinner buffet. This is a great setting just past the swimming pool and entertainment by the local Makishi dancers takes place every night. • This is the only hotel with a view of the bridge and gorges below. 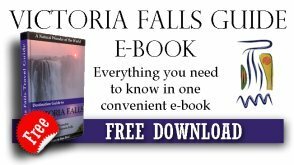 • It is only a ten minute walk from the hotel to the Victoria Falls entrance and there is a private path from the hotel which brings you out at that entrance to the Victoria Falls. • Grand and colonial atmosphere, steeped in history. 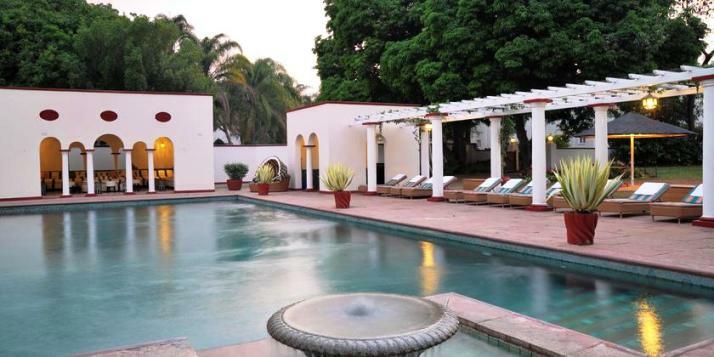 The Victoria Falls Hotel is a delightfully romantic setting for a wedding in Victoria Falls and for honeymoons. From the charming little in-house chapel to the luxurious Honeymoon Suites. The honeymooners will be made to feel special with chocolates, red roses and a fresh fruit platter. The Chapel is available for private ceremonies and weddings. Outdoor receptions can be organised in the hotel's gardens with views overlooking The Victoria Falls Bridge. Airport transfers can be arranged from Victoria Falls, Kasane and Livingstone airports. Contact us for more information.